Added on February 13, 2019 by Meredith Keating. For our fifth interview of the 2019 Delaware Fun-A-Day, we talk to Melanie McKay a.k.a. Magical Mel Mel about Valentine’s Day, creating art you love, arts in education, and the power of color! Thanks, Melanie! We like to know how people are connected to Delaware Fun a Day - are you a resident, born and raised? What opportunities have you found being in the exhibit? A few years back, while I was attending Cecil College, one of my best friends (and now organizer of fun-a-day) Meredith, told me that she was going to participate in a local art show called Fun-A-Day and asked if I wanted to participate as well. It sounded like a really fun idea and a great way to get back into creating art, so I signed right up! I’m originally from North East Maryland and now live in West Chester Pennsylvania, but still love to participate in the Fun-A-Day art show! This is going to be your THIRD year participating! Can you describe your favorite past Fun-A-Day project? When it comes to my Fun-A-Day projects, I like to create art based on themes that are close to my heart. I love both of my previous projects for the same reason… the subject matter was of someone I really love! <3 The 1st year I participated in Fun-A-Day, my project was called “Nappy the Cat”. The entire project was based around my cat! What’s not to love about that!? Last year, my project was also very special to me because my baby nephew was the center of the project! I called it “Happy-Birth-Day”. The maker month last year just so happened to fall on the month of his very 1st birthday, so I decided to make a photo album documenting him growing up until his 1st birthday party at the end of the month! It was really cool to see how much he grew by the time I was putting the finishing touches on my project for the show! As an educator that works with elementary students, what art projects or activities have you had students do during your years of being an educator? There are 2 things you should know about me: I love the arts and I love little kids! Being an elementary school teacher has been the best of both worlds! Over the years I am proud to say that I have incorporated the arts into many of my lessons! As teachers, it’s our job to teach our classes certain curriculum, and generally it doesn’t require the arts. Sometimes I try to find creative ways to sneak art projects into lessons that typically wouldn’t have an art component. For example, back when I was student teaching, I snuck in an art project into an Earth Day lesson. I taught all about the importance of recycling, then had the class write a persuasive essay to a friend, family member, or school staff member persuading them to begin recycling based off of all the information they learned through the lesson. Then, right at the end, I snuck in an art project where the students all got to make their own planet earth out of paper plates, tissue paper, and markers. They got to decorate them however they wanted. I think it’s very important to include the arts into lessons taught in school! It’s because of that belief that I am known to find creative ways to sneaking the arts into my lessons, like with the Earth Day lesson. I have also been known to bring my trombone into school and perform Disney concerts for my students. They get such a kick out of little things like that! Please describe your 2019 project "Happy-Valentine's-Day". Since the maker month this year was February, I decided it would be fun to have a Valentine’s Day themed project this time around. I have done photography for the most part in my previous 2 shows, so decided to change things up this year and incorporate different kinds of art as well… to really push myself and showcase all the different types of art I can make. I have recently taken up sewing lessons and a major part of my project this year is little sewn valentine hearts. I have also tried beading for the first time for this project and am eager to showcase some beaded valentine hearts this year! Of course photography is my go-to medium, so you can look forward to seeing Valentine’s Day themed photos as well! Apart from those main pieces to the project, you can also look forward to seeing decorations made out of conversation hearts and other heart themed 2D and 3D items! As a seasoned Delaware Fun-A-Day participant, what advice can you give our newcomers? Is there any piece of advice that you believe would be a top priority for rookies to take a hold of? To be very honest here, I myself am still learning a lot when it comes to managing the maker month for Fun-A-Day. I would say what has been most helpful to keeping me on track with creating my projects over the years is to start off with a clear vision of what you want to make and how you want the finished product to look. Sometimes I get a little too ambitious with my ideas and have to scale way down to make the project more obtainable in the end. Starting with a clear vision can help avoid this process. Also sticking to concepts that can be done quickly can also help you keep the project moving, because remember… you’re creating a new piece of art every day for an entire month! It has to keep moving! We’d like to take a trip back in time with this next question. Back in 2013, you did your first Delaware Fun a Day project (which was on Market Street). In the space, the artists had complete freedom and creativity to use the space, which was being renovated at the time. Can you explain your experience that year and why it was special? My experiences with the past 2 times that I participated in Fun-A-Day have been very different from each other. I remember the first year that I participated when I was back in college. The space we were given to host the big show was an old apartment right across from the DCAD art school. Having the show there was cool because us artists were literally allowed to display our projects however we wanted, and when I say “however we wanted” I really mean we could do ANYTHING we pleased! I remember some people painted the walls by their displays to showcase their projects better. I remember people straight up hanging their projects on the walls with nails, since the walls were all going to be fixed up after the show anyhow. I myself displayed my “Nappy the Cat” project in a window. 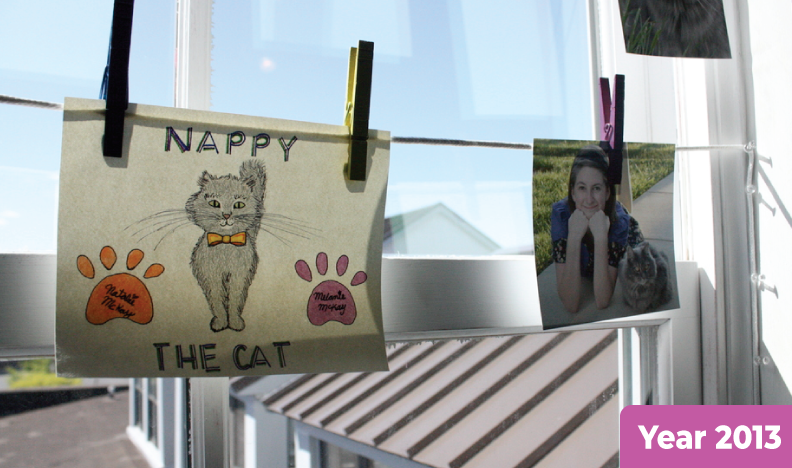 I hung mini clotheslines across a window frame and hung my photographs of Nappy on them. I used tacks to hang them up (which is definitely not allowed anymore in these new venues!!). I also was allowed to bring in my own table to display the rest of my photographs and sculptures on. At the time, each artist had their very own space to display their work. Now that we have more participants, we have to share tables and wall space with other artists, so we have to keep that in mind when planning how to display our work. Your prior two Delaware Fun a Day projects have involved things that you hold dear and close to your heart. With one being your wonderful cat Nappy and the other spotlighting your nephew, can you tell us why you center your work around family and loved ones? When it came to planning out my 2 prior projects showcasing my cat Nappy and baby nephew I thought about how I wanted to capture them as they are in everyday life. That inspired me to take the photographic approach when creating my pieces. With both of those projects, I would go to my subjects with my camera and take pictures of them living their daily lives. I also tried to keep each photo shoot very short keeping in mind that babies and cats don’t quite grasp the concept of sitting still and posing for pictures! I chose to aim towards capturing both Nappy and baby Hadley in their natural environments because I wanted these shoots to be very personal to them and show each of them in the places they love, doing things they enjoy, and with the people they love. The best advice I could give about doing a project showcasing loved ones is to capture the essence of them in your projects, because it makes for a more authentic and overall fun piece! We know you are fascinated with color, you've expressed this through your personality and work. What challenges do you think doing an exhibit based around Valentine's Day is going to create in regards to working with all the colors and not the traditional holiday colors? Anyone who knows me knows that I’m the rainbow queen! We all associate Valentine’s Day with the colors red and pink, so I kept that in mind for some of my pieces. However, again, I love color so decided not to limit myself strictly to those classic Valentine’s Day colors for my project. I branched out and incorporated pastel colors as well, trying to keep things dainty and frilly. You will see that I used lots of pastel pinks, purples, and blues together, as well as a lot of pearls and crystal-like gems. I also tried to include the pastel colors of conversation hearts to my project. When it came to the photo shoots, I let the couples participating choose what they wanted to wear, as I was giving them the finished products at the end of the show. Overall though, I tried to stick to a pastel color scheme to keep the overall project more dainty and frilly like old school valentines. Well, to be honest, I primarily participate in the Fun-A-Day show simply for fun! I typically don’t sell my artwork after the shows, instead I give my projects to family members and friends, or keep pieces to display in my own home. I am not really into social media either, so it can be a little hard to keep up with me and my work. You will see more from me next year at Fun-A-Day and can also see more of my sewing when I wear my handmade Vanelopee Von Schweetz costume in the Cecil Con Cosplay Contest at Cecil College this April!